Enough - I've had it! Went to buy some more replacement razor cartridges to my recently bought 3-blade Schick Hydro. Couldn't find any at the shop. I now have to fork out for a flamin' 5-blade razor or something. This is lunacy!!! These manufacturers keep adding to the number of blades in the name of "innovation" every year. Some innovation! Has anyone had any experience with these? Any tips on how to avoid slicing your head off? Anders my friend, I hate to break it to you, but women have shaving issues, too, you know. Hmmm... this thread seems to have attracted the fastest response in S&S history! OK, ok... any women interested in shaving solutions - please join in. they're not called safety razors for nothing. Cut throat razors are pretty easy to use if you keep them very sharp. So you'll need a strop. As long as you're going all retro you should consider a handlebar and moustache wax. Or just don't shave at all. Go feral. I have done just that. Six months without haircut and four months without a shave. I am a caveman. Buy three blade disposables. You are right about the replacement cartridges. make sure you have disposables as back up for hung over days! Yes, there is the risk factor to consider with cut-throat razors. The question is: do you have the balls to shave with a straight razor? These are among the most popular of razors, with a replaceable plastic cartridge usually holding three to five blades. The shave generally won't be as close as with a double-edge safety razor but better than one with a disposable razor. Made of plastic with non-removable razor blades that tend to dull fast, these are designed for convenience. The blades tend to not be as sharp as non-disposables, so the shave may not be as close. I don't shave my balls with disposable razors, so certainly not going to do so with a cut throat! No, I don't have the balls. I am never able to remember which brand I have so usually find it's just as economical to by a new pack with a handle and 5 or 10 refills. My recent experience with barbers has been that they use a razor that looks like a cut-throat but uses double sided or a split razor blade in it. They could be a cheap alternative, obviously you should practice on your face first before heading south. I haven't shaved in 8 years. It's quite a saving. I do have some clippers which I can simply run all over my entire head and save on barber costs as well. I haven't paid for a haircut for 15 years. I had my first straight razor shave in the Louisiana State University Student Union barbershop over twenty years ago. I just wanted a haircut, I did not realise the shave was thrown in. You want to talk about "secret mens business" and such. There are certain events in a young man's life that remain forever as vivid memories. A recall the hot shaving cream via some sort of fancy barbershop dispenser, seeing that...what the...HOLY sh*t IS THAT A f*ckING STRAIGHT RAZOR I THOUGHT THOSE WERE PROPS IN HORROR MOVIES HE'S SHARPENING IT ON THE f*ckING LEATHER BELT OH MY f*ckING GOD and the absolute terror that any movement during the shave would end my life. i would agree with dose, though my straight razor shave was in japan. if you ever get your hair cut in japan, throw in the extra 3-4 bucks for a shave.... better than a massage. first the hot towels on the face, then the shave (which took a good 15 minutes--and thats with me opting out of the "eyelid shave"--i don't think eyelid hair is a big problem, at least not relative to my other problems which are legion). and they throw in a scalp massage and a shoulder rub too... bliss. and because i'm not japanese they assume i can't understand anything and don't even pester me with annoying barber chat. 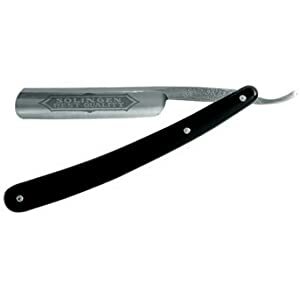 Right, after some research I have now ordered the straight razor and associated paraphernalia. Anyway, my dislike for disposable consumerism made me decide on the straight razor. It should last a lifetime. If I stop posting after the razor arrives, you know what has happened. So I'd better take the opportunity right away to thank you all for a great forum. I love youse all. Sorry that I'm late to this party, but I use the double edge safety razors. They work well and irritate less than the cartridges, but I find that the shave takes quite a bit longer. Also, it is easy to go a little bit nuts over the variety of shaving soaps and creams and brushes available, which kind of negates the savings over cartridges . Good luck with the straight razor and don't forget to visit badgerandblade.com - good forums, product reviews and technique guides. I've just done my first shave with the cut-throat razor. Obviously I am alive to tell the tale. The razor should be shave ready from the factory, but following some advice on the forums, it is good to do some stropping first. My first mistake was to do this very badly such that I nicked the leather strop in several places. Not a good first sign of what was to come. It takes quite a bit of time to wet shave with this kind of razor. You should prep your beard first with a hot towel. I didn't want to mess with that so I just splashed some hot water on my face. You then have to make the lather with the shaving soap. This takes a good minute or so while making sure you have just the right amount of water in the mix, such that the lather doesn't end up too dry or too sloppy. After carefully making the lather I discovered my face had gone cold with the previously splashed hot water, so I re-splashed some and massaged the face in the process before I applied the lather. Looking like a terrified Santa Claus with trembling hands (and knees), I lifted the razor to the side of my cheeks (the face ones, of course). Self talk doesn't help here, but it does help you think about the technique: 30 degrees angle with the grain, 15 degrees against the grain, short movements. >Scratch< was the only sound the razor made as it cut through the beard growth (with the grain). No tugging of strands at all! Quite comfortable, really! I felt very proud of myself until I checked the patch of skin where the razor had just gone over - and felt a still hard stubble sticking up. Hmmm... this requires figuring out how much pressure you put against the skin without cutting yourself. I was too chicken to try the required amount of pressure. And going against the grain on my throat was just too damned scary for a first attempt. But against the grain on the cheeks were fine. This part of the face is pretty flat also. I kept scraping until my knees were too weak to continue any longer with the intense focus that was required. My face felt like the top layer of the skin had been exfoliated and I quickly applied the aftershave. I don't usually use aftershave. I hate those things you buy in normal shops. They always smell either too sweet or have some weird pissy toilet smell. For this occasion I had ordered an Italian menthol-smelling thing (Proraso) that was an aftershave first and a fragrance second - just like you would expect to find in a men's barber shop. The result: my cheeks (on my face) are as smooth as the proverbial baby's bottom!!! Actually, this was the best shave ever in that area. But I still have stubble just below my chin and on my throat. All in all - a very encouraging result. With some more practice this will be my preferred method of shaving - no questions about it. With a macho swagger (or was it the weak knees?) I approached my dear wife for the kiss test. She gave me a great peck and a sweet smile (as she usually does). "That's lovely, dear! But you smell like an old Italian guy that has just been to the barber's"
Throat Beard for teh win!!! What kind of shaving soap are you using? I got the Taylor of Old Bond Street (avocado) shaving cream. Next time I'll try the sandalwood scented stuff and aftershave, but I just wanted to save a bit of money for the first kit and kaboodle - just in case the shaving experience would turn out to be a disaster. But hey - I'm hooked already. The face feels really smoooooth! Hey - I have Wahl clippers as well! Have used them for years now, ever since I started riding a motorbike in my old age (for 10+ years). I ride every day for commuting to work. I just got pissed off with having helmet hair with a normal hair do - so one day I just bought clippers and starting to cut my own hair. I taper my haircut with a number 4 on top and gradually down to 1 on the back and sides. It is an advantage to cut your own hair as I know all my own lumps on my head and can compensate for them so my head doesn't look misshapen. Perhaps I should have done a PhD in Phrenology? Well if you ever do plan to shave your balls, perhaps you could take some advice from the olympic female weightlifters.